There are so many things I look forward to with my little man; exploring the countryside, fun and frolics on the beach and in the sea, arts and crafts, dressing up….the list is endless. One things I love to see little ones do is have fun dressing up, playing and using their imagination whilst they are in character. I cant wait until Tristan is dressing up….I can picture him running around the house as a superhero. So far Tristan has dressed up as a little pumpkin for Halloween and he has had a little Santa costume for Christmas. 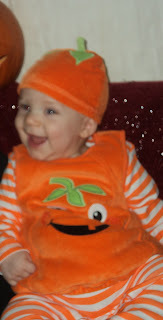 Cutest pumpkin in the patch! This is my entry for This Mummy Loves Tutus andSuperheroes competition sponsored by Appliances Online Washing Machines. Aw what a lovely little boy! I've seen the pumpkin costume before and it's so cute!